The paintings in Sandy Ostrau's new exhibition "Improvisations," on view at the Thomas Reynolds Gallery in San Francisco, always refer to something. 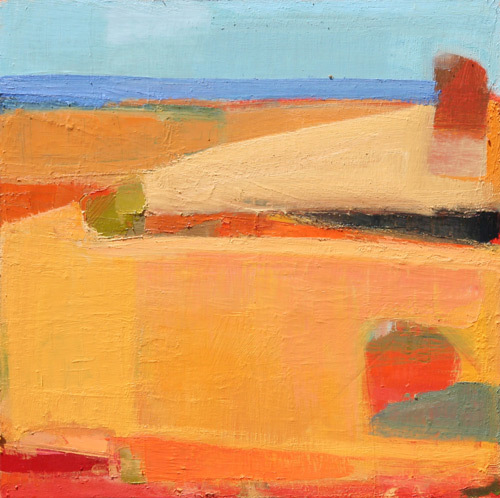 One suite of paintings suggests coastal hillsides punctuated by zones of sky, wall and water. Another series begins with images of jazz musicians, and a third is based on figures lounging by swimming pools. In each instance the subject matter is definitely there, transmuted into a painted evocation. Sandy Ostrau An intuitive artist who loves paint as a substance -- and who has a tendency to obliterate her imagery with painterly gestures -- Ostrau doesn't go all the way to abstraction. To do so would remove the emotional connection she wants viewers to have with her source material. 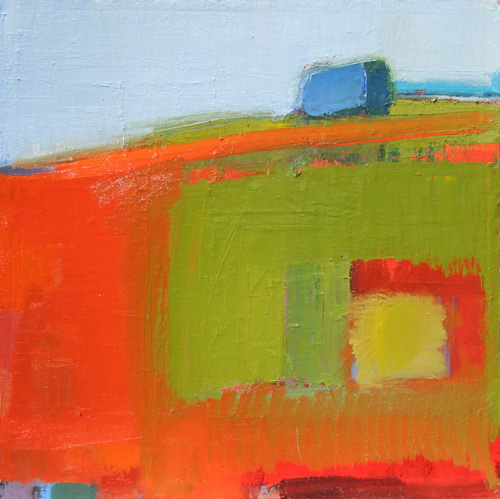 "I'm not a fully abstract painter," she explains: "I want people to feel the landscape." I recently interviewed Sandy Ostrau and asked her about her art and ideas. Tell me a bit about your background. Since you grew up in Palo Alto when did you first become aware of Bay Area painting and its traditions? Growing up I was not really aware of what was happening there right under my nose. I was more interested in doing my own drawings and designs during high school and was mainly interested in Classical Art and architecture in those days. I didn't appreciate the Bay Area artists until I had moved back to Palo Alto as an adult and then began to discover their art. 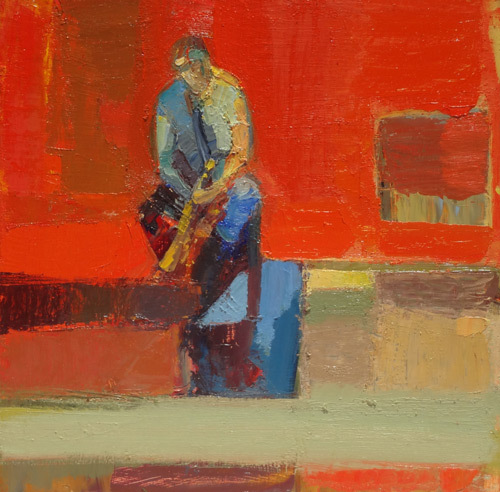 I was immediately drawn to Nathan Oliviera's and Elmer Bischoff's work. At the Art Exchange in San Francisco many years ago we found a fantastic drawing by Paul Wonner and my exploration of Bay Area art expanded. Paul Karlstrom says you "know where to stop." Is he right? I hope so! Over-working a painting is the kiss of death. Over-painting usually results in tentative work. A confident brush stroke or mark is much more emotionally evoking and exciting for the viewer than a tentative stroke. I want my paintings to convey confidence in paint application and in design. I strive for freshness but in a controlled way. I am very controlled in my work as Paul Karlstrom also recognized. I move the paint around a LOT. It's a process that takes time. Can you tell me about your color sense and about how you manipulate color? I use a limited palette. As each painting progresses, the colors unify and become more harmonious. The harmonies happen because there is a bit of each color in every other color. I am always thinking about warm and cool, and also about value: value is the key. I keep in mind what my friend and mentor Jim Smyth says: "Value does all the work, but color gets the glory." I mix my colors on a 4 foot long palette of freezer paper laid over boards. 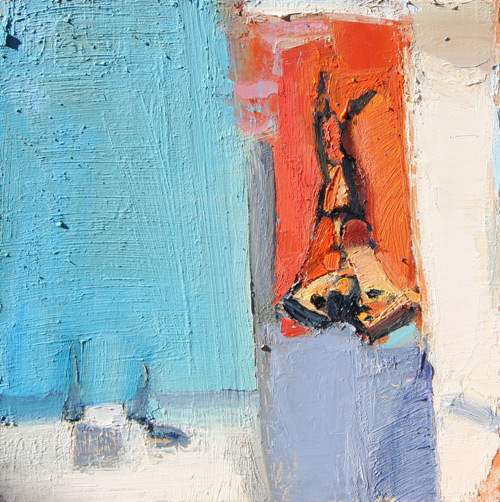 Nathan Oliveira, Henry Villierme, Elmer Bischoff, Raimonds Staprans, Nicholas De Stael, Kim Frohsin and of course David Park and Richard Diebenkorn. What are some of the tools and techniques you use to give your paintings unity? 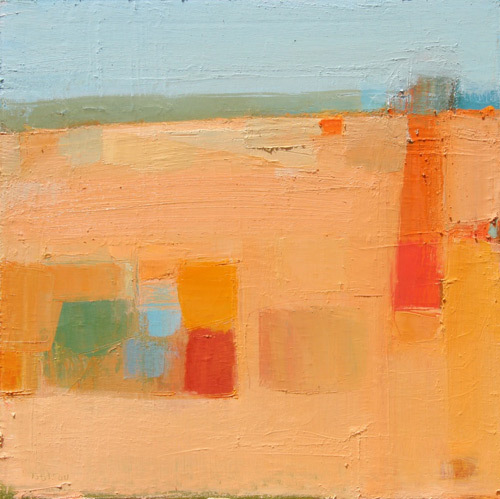 What I am interested in depicting in my paintings are a structure and organization as well as harmonious color. I use geometry and texture to create structure and to distill the shapes of the elements in my painting. Texture is used to support the center of interest by moving the eye through out the canvas. Thick and thin paint, matte and glossy surface all help create interesting fields of color. The color fields in ranging values set the stage for the structure of the painting. 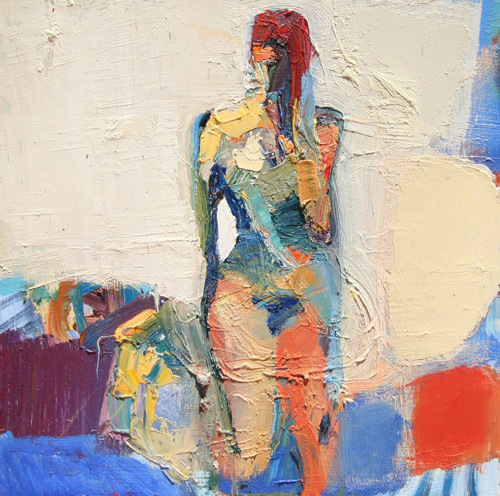 How has the introduction of human figures affected your recent work? In terms of figuration, I'm not trying to make it "right." Instead, I ask questions about the presence of the figures: what are they doing or where are they? That integrates the landscape and the figure. When I try too hard to make the figure look like something it destroys the unity of the painting. One of your series depicts jazz musicians. How did that series come about? Well, I have a 23 year old son who plays bass and we have an upright bass in our house, so music is around. I enjoy jazz but am not knowledgeable about it. My jazz series began after I heard a performance of "Anti-Mass," a piece commissioned by the De Young Museum from a jazz musician and composer named Erik Jekabson: that piece was fabulous. I did a painting of Erik which was used as a poster for the 2013 Fillmore Jazz Festival. After that painting I had more ideas, did some sketches, and painted a bass player, a couple of trumpet and viola players, and a trio that included three members of Erik Jekabson's group. I feel like the modernity of jazz goes perfectly with my interest in abstraction. I'm going to continue working with some of these ideas. How do you hope viewers will respond to your paintings? I hope that they are enjoying them. They are seeing a push towards abstraction in a way that is structural. 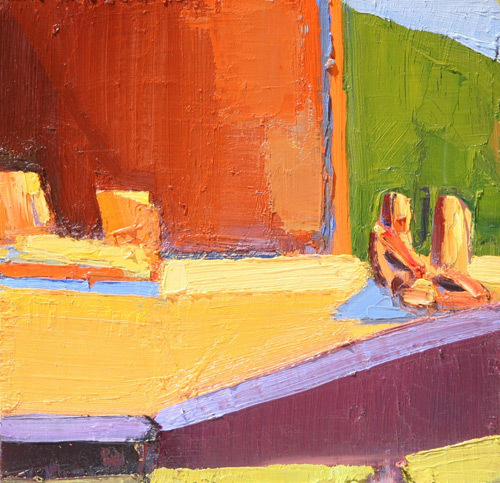 I began as a plein air painter, and as I have added figures my thinking has evolved and changed. I want them to relate and put their mark on them and have a personal emotional connection. They are paintings, and nothing is meant to be exact. The question is where do you see yourself in each painting?